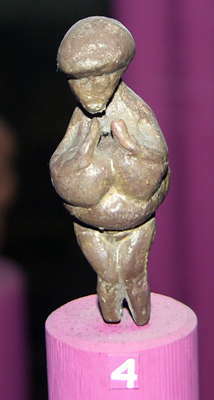 The Gagarino venus from the right side. 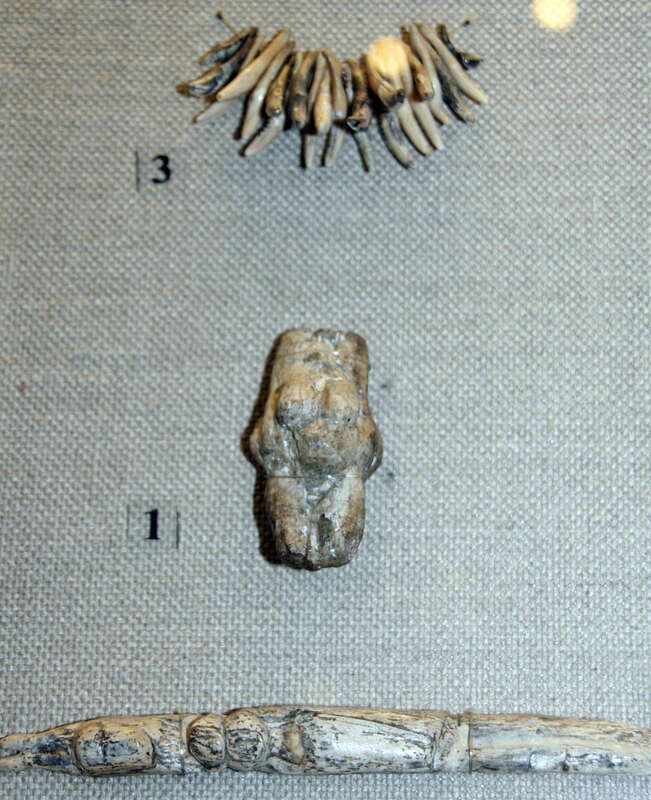 Detailed views of the front and back. Frontal view of the Gagarino venus. 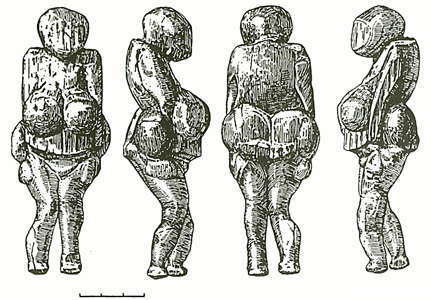 Source: Facsimile at the Venusium, a museum at Willendorf in Austria. Fox teeth, Gagarino, 23 000 BP. 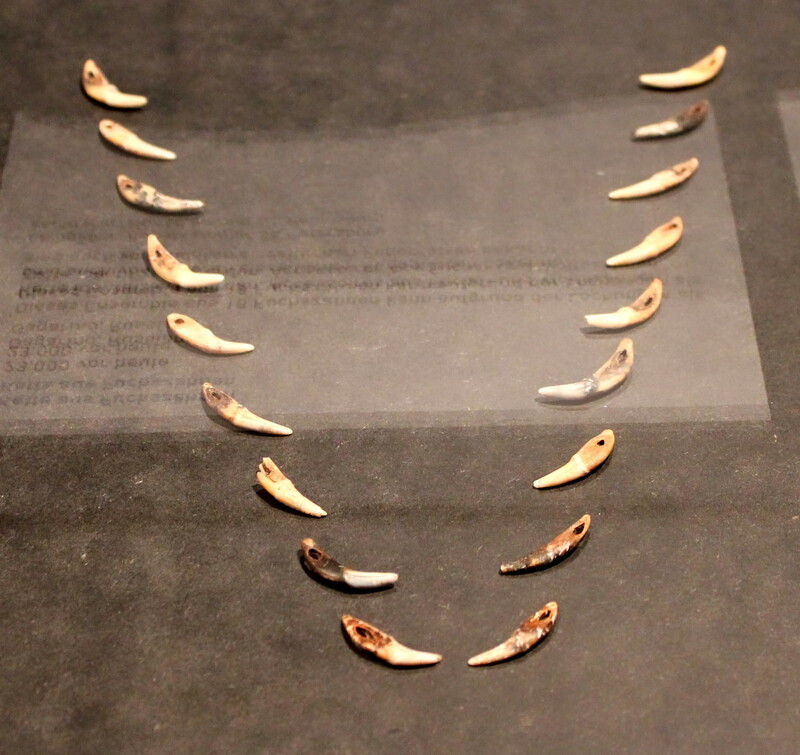 This group of 18 fox teeth can be identified as a chain from the perforations. 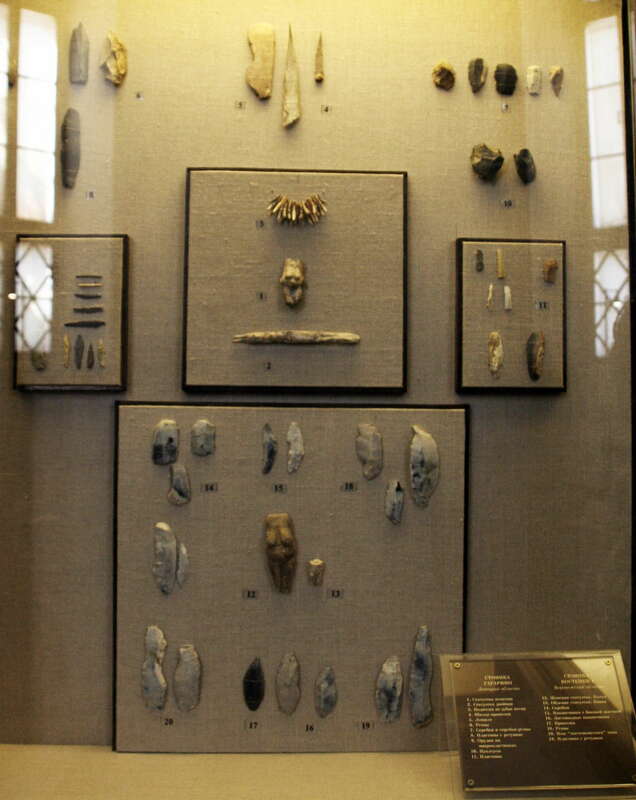 Jewellery from fox and wolf teeth are also known from other ice age sites. 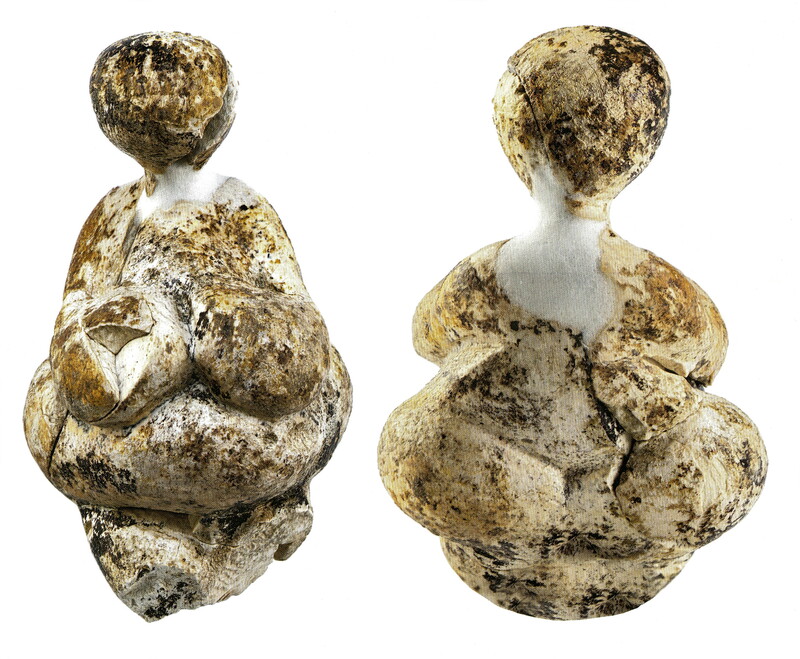 Double statuette of Gagarino, 148 mm x 52 mm x 12 mm. 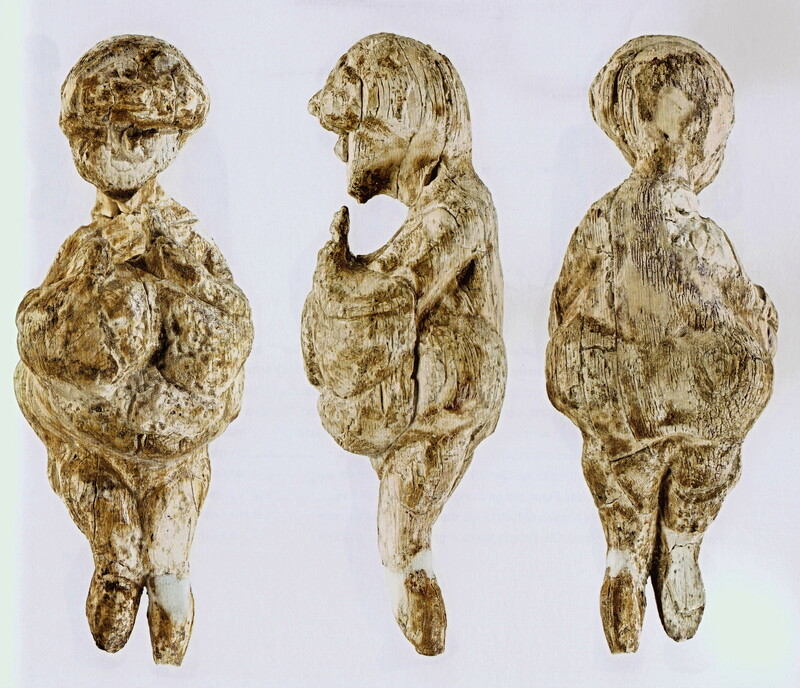 The unfinished nature of Palaeolithic statuettes is a widespread phenomenon. 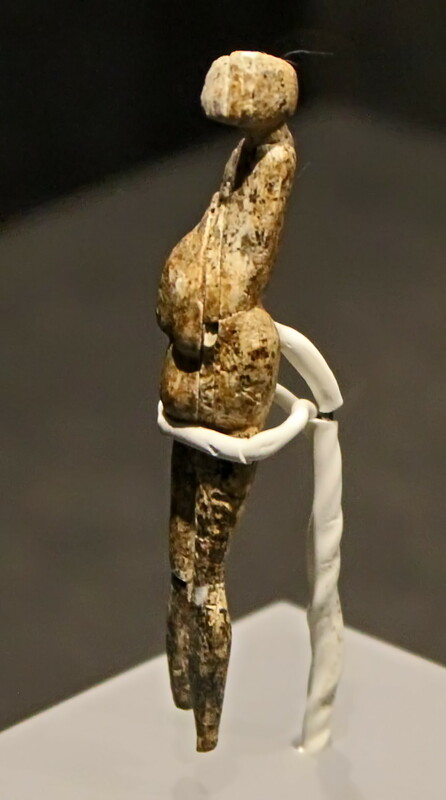 It is probable that completion of the double statuette of Gagarino was abandoned after a fracture developed during manufacture. 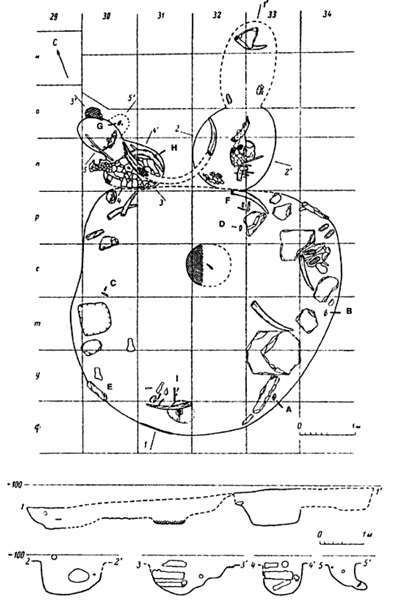 It is fascinating to conjecture whether there is some relationship with the double burial at Sunghir, although since it is at least 500 km distant, this is just conjecture at this point. Double statuette of Gagarino, with the arrow pointing to the place it was discovered in the dig. 1. Статуэтка женская - female statuette, facsimile. 2. Статуэтка двойная - double statuette, facsimile. 3. 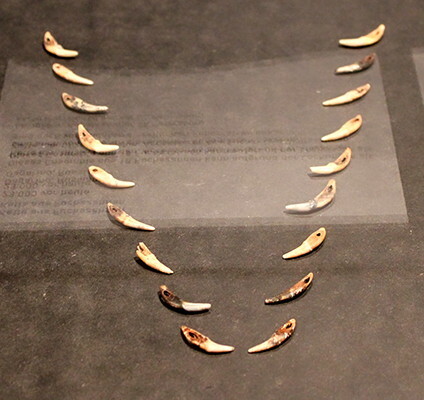 Подвески из зубов песца - necklace of polar fox teeth. Gagarino Double Venus, the object shown as a facsimile at the foot of the photo above. 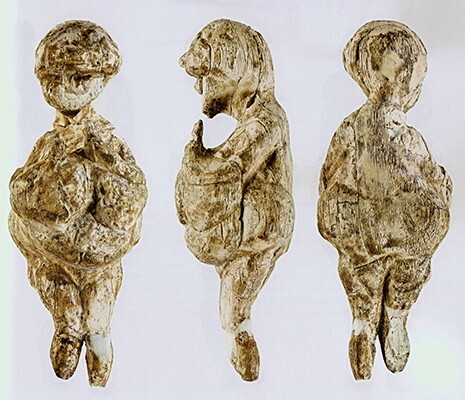 This has been interpreted as purposeful, similar to the way that the child burials at Sunghir were head to head. 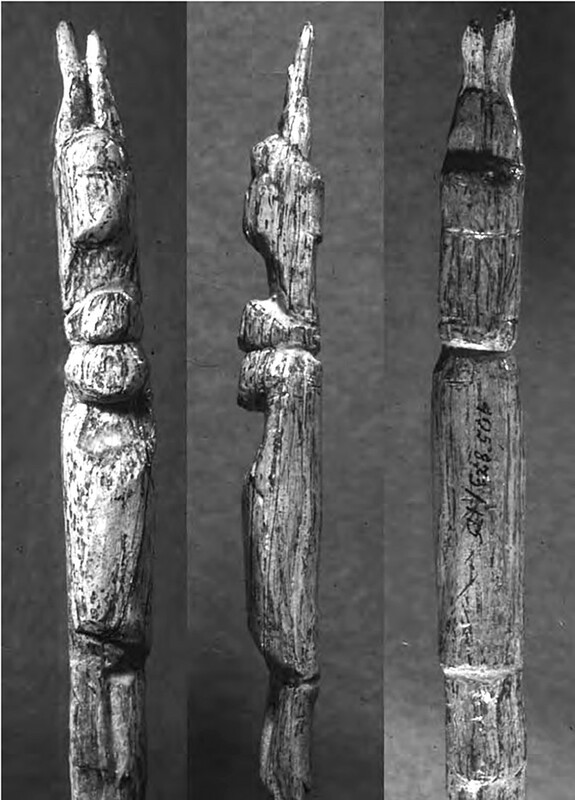 The so-called 'double statuette' from Gagarino in Russia, which is in fact two unfinished statuettes in the course of being sculpted on a single ivory rod. 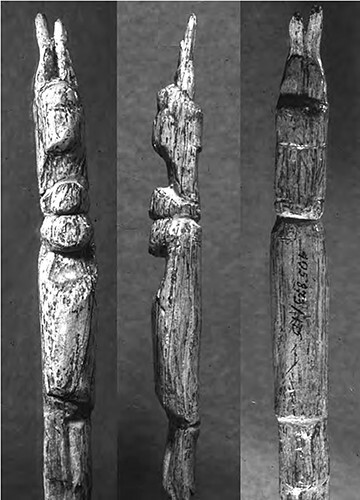 Both top and bottom figures show the same angled chest shelf that one sees on La Fillette. (Photo R. White). The Gagarino Double Venus, as interpreted by the talented artist Libor Balák. This statuette is of particular interest, because of the unique pose: arms on the chest and hands raised to the face in a 'prayer' gesture. 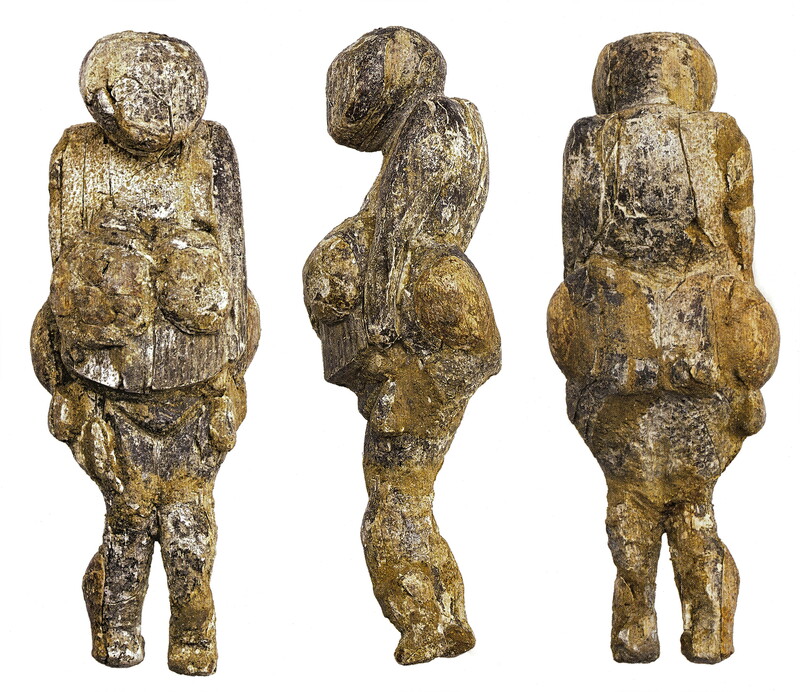 This is a detailed view of the 'prayer' venus from Gagarino from several sides. 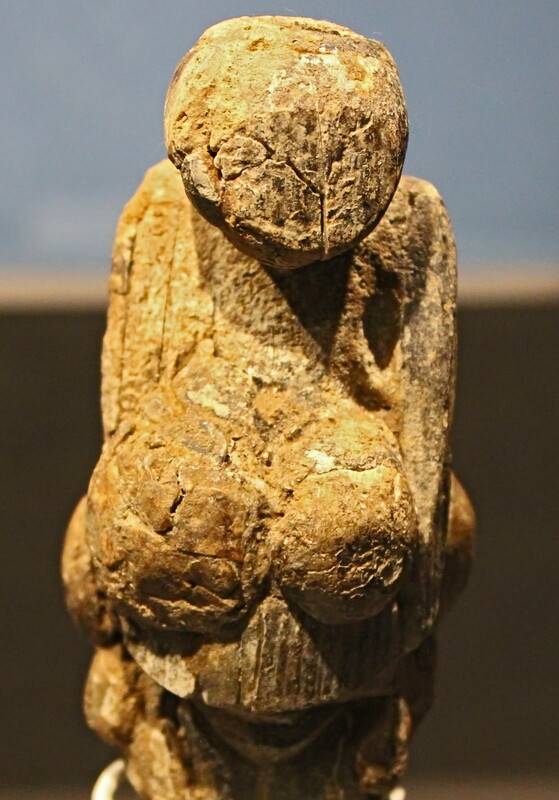 Another facsimile of the 'praying' venus. Statuette féminine de Gagarino, vue de profil. Collection MAE. 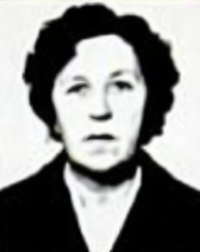 Photo L. Iakovleva. Venus from Gagarino, in profile view. 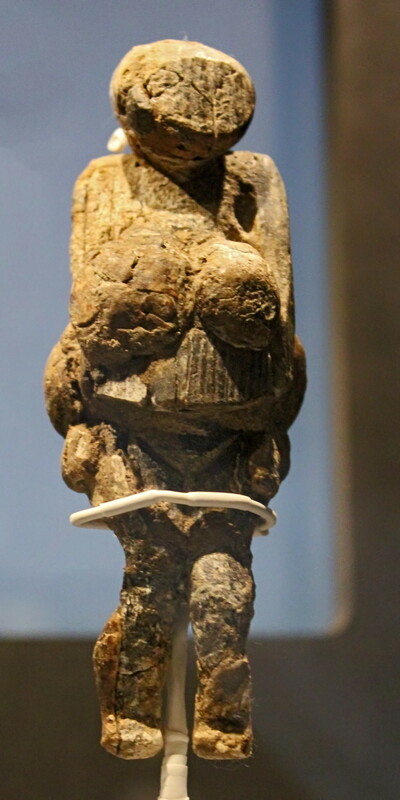 This is a fascinating venus figure, a front view of the venus shown in profile above. 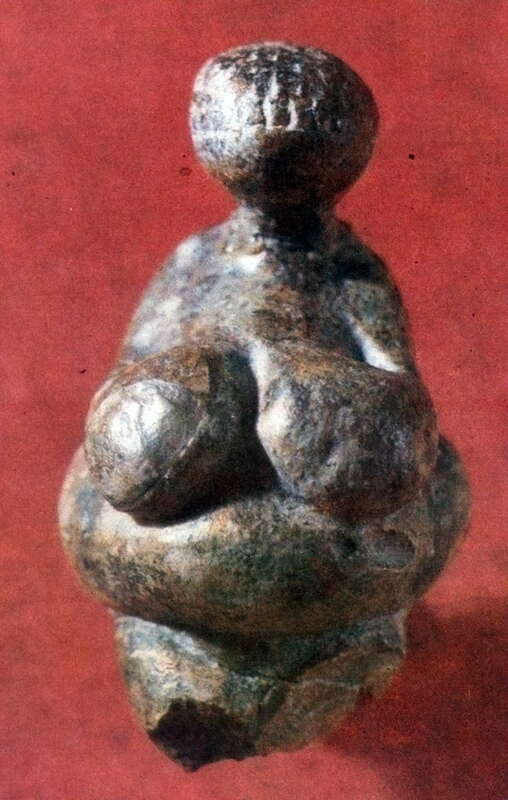 It has what appears to be an item of clothing or decoration below the breasts, the functionality of which is unclear. 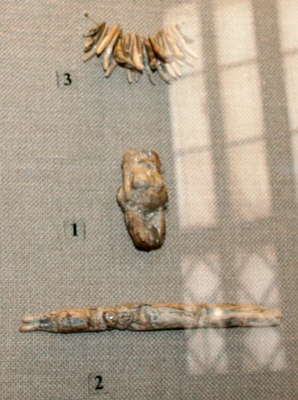 The Venus above, front, back, and profiles. Detailed version, in colour, of the above. 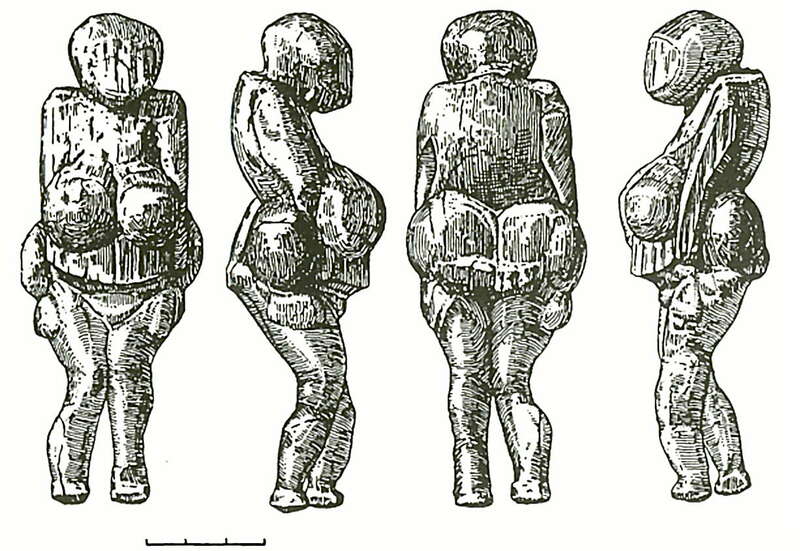 This is a good and detailed image of the original of a figurine from Gagarino known as 1927c. 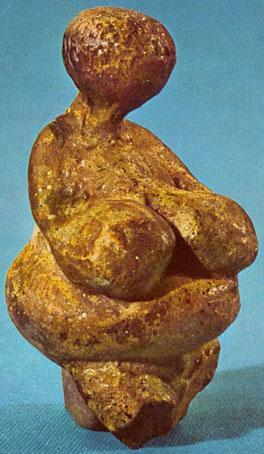 I think of this as the 'tall' Gagarino venus. 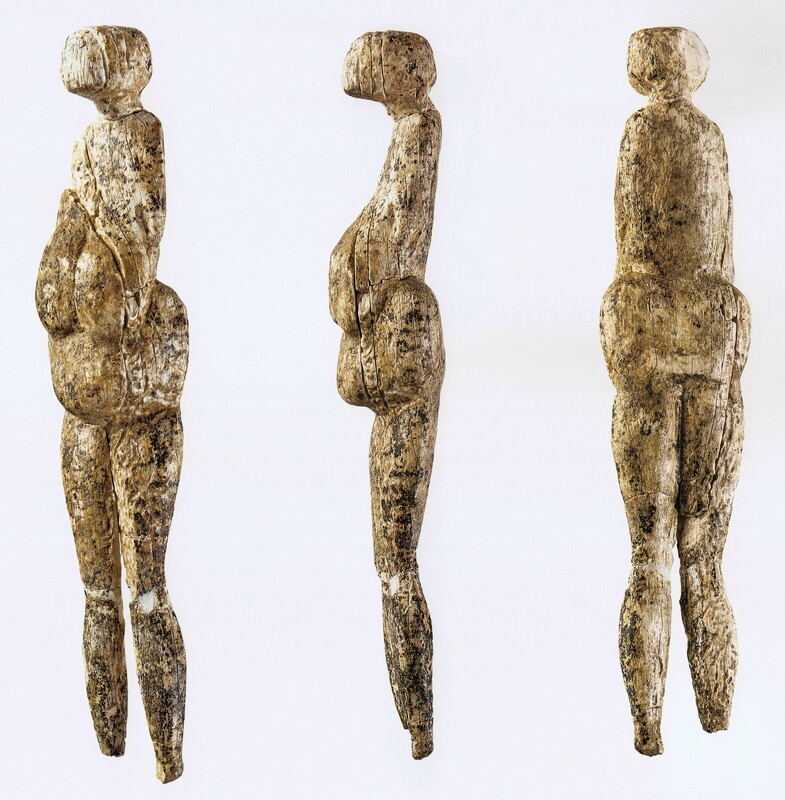 This venus, with relatively thin legs, is plump at the abdomen and breasts, as if carved from life. It is often misidentified as being from Mal'ta. 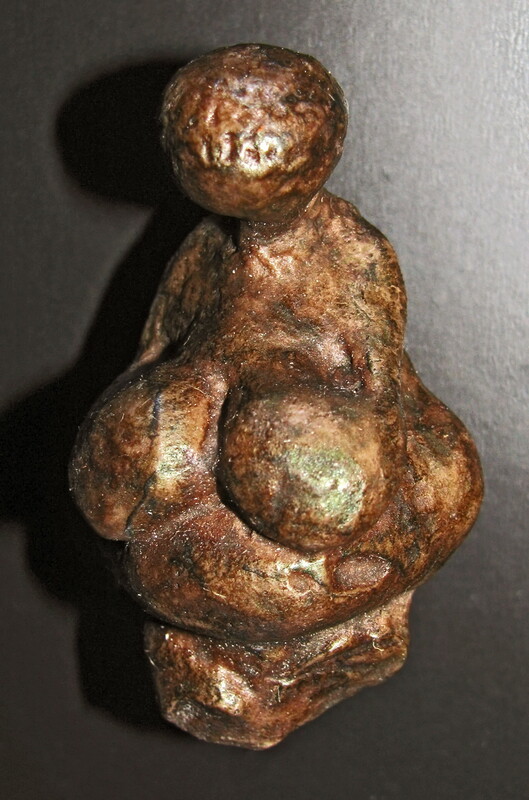 White (2007) calls it Gagarino Statuette 1927c. I think this is the original, since it was taken by Randall White. This appears to be a facsimile. 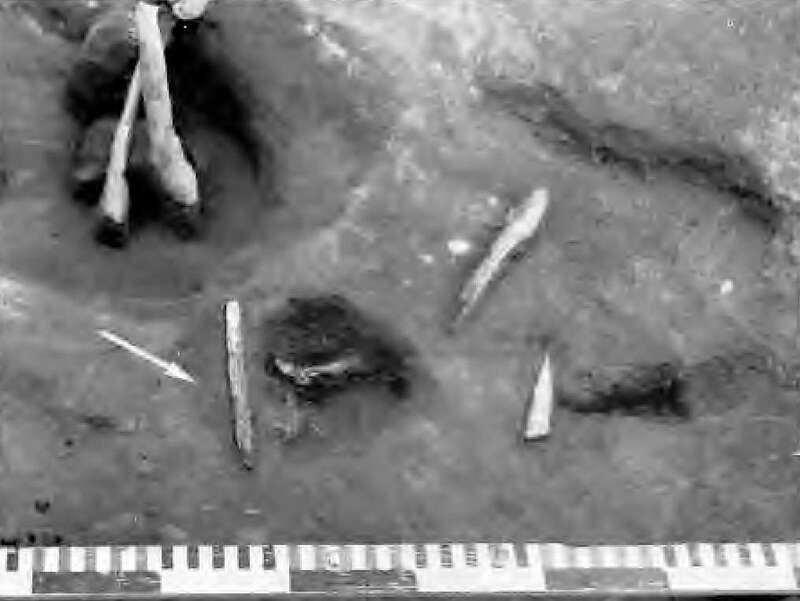 Note that these images appear to have been poorly 'cut out' from the original photos. Note the close similarity of the 'tall' Gagarino lvenus to the Avdeevo venus shown here. It could easily have been done by the same artist. 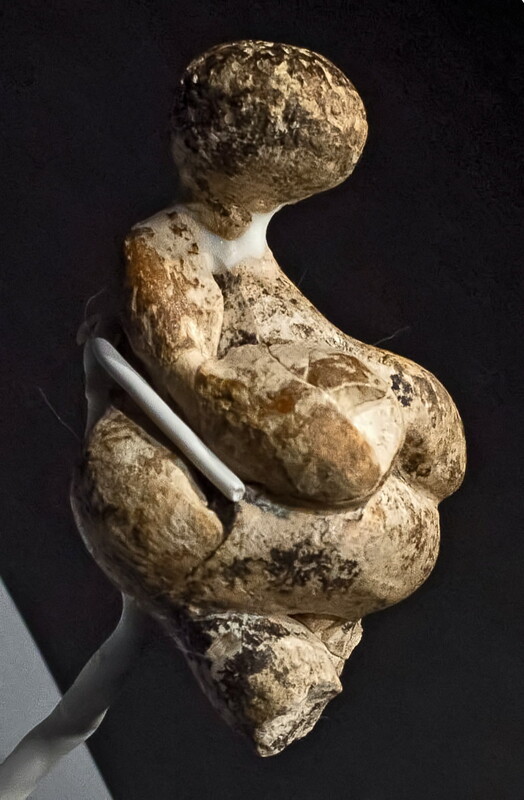 This figurine No. 5 (Old Avdeevo Avd-St 49) was found in fragments in the wall of a pit. 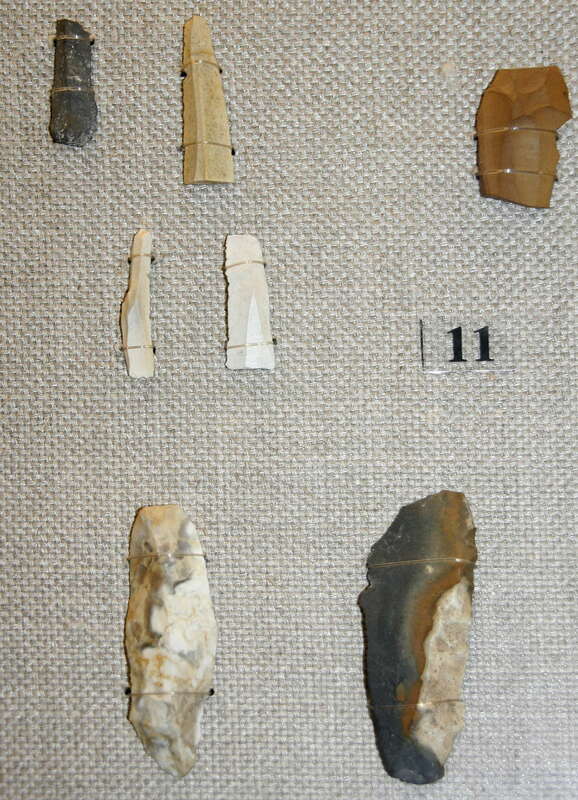 It is 160 mm long, 30 mm wide, and only 11 mm thick. 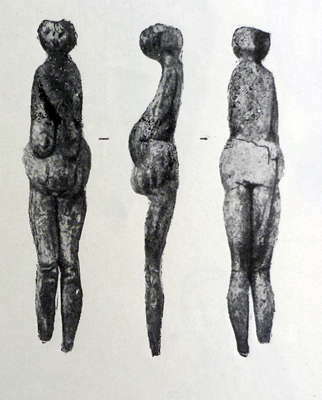 The buttocks and the lower portion of the legs are missing. The figurine is completely smoothed and finished. 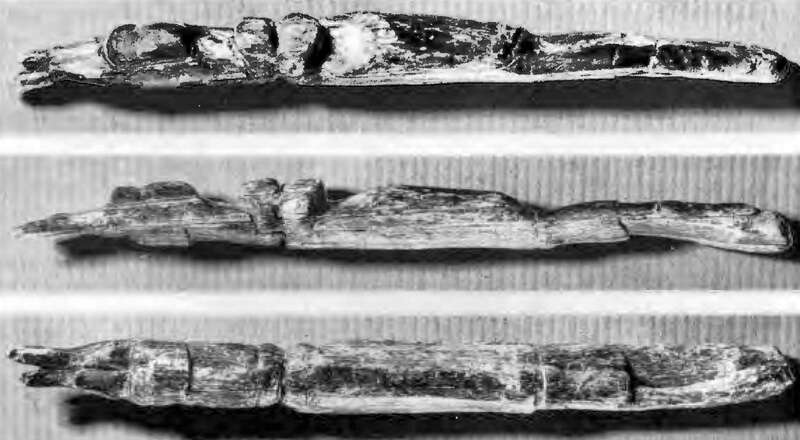 * Bone fasteners and a biconical perforation technique which is unknown to Kostienki 1 (I) and Avdeevo. 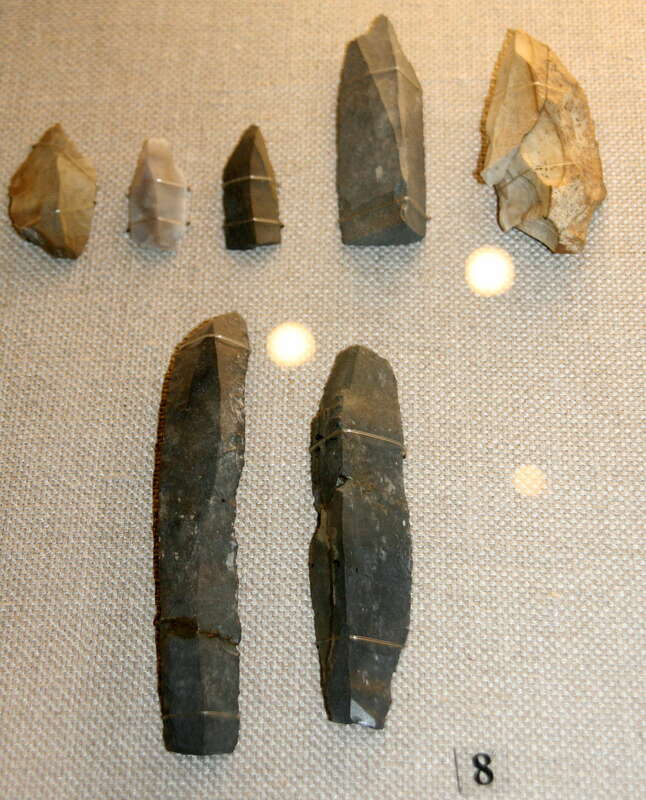 The most specific features of the Gagarino lithic assemblage are that the proportions of tanged points are different from that of Avdeevo and Kostienki 1, there are particular forms of tanged points and Kostienki knives. 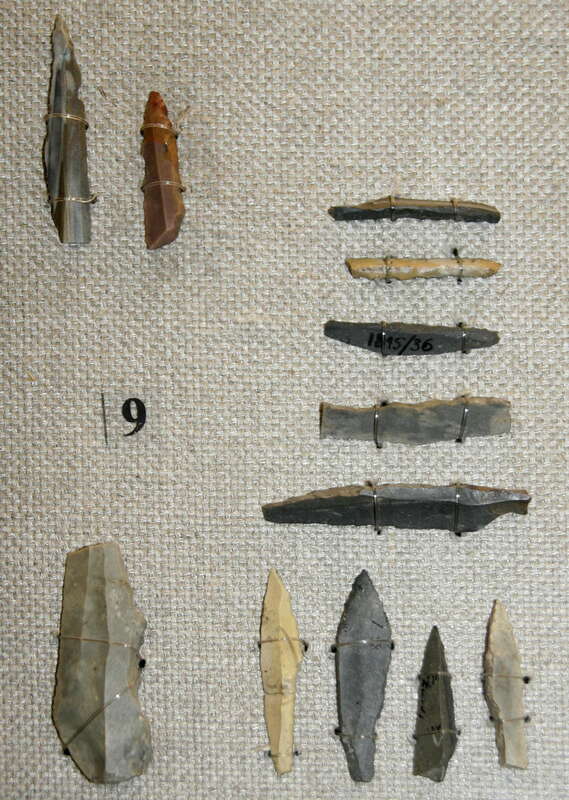 A series of eight dates were obtained, of which two are most likely: 21 600 ± 140 BP and 21 800 ± 300 BP. 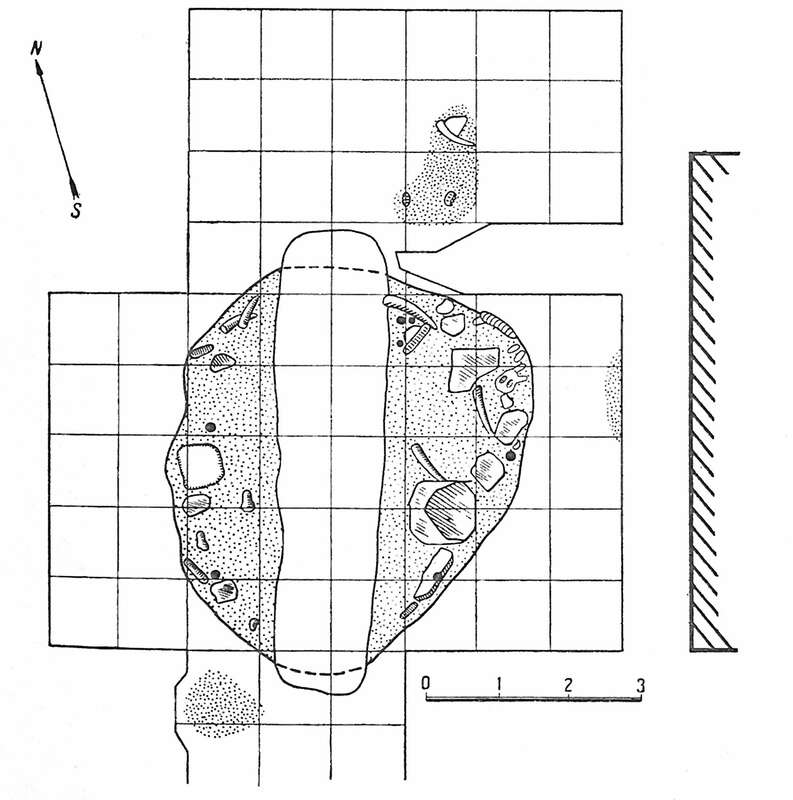 Plan and profile of the habitation at Gagarino. Photo: Abramova (1995) after Tarassov (1979), fig. 27. 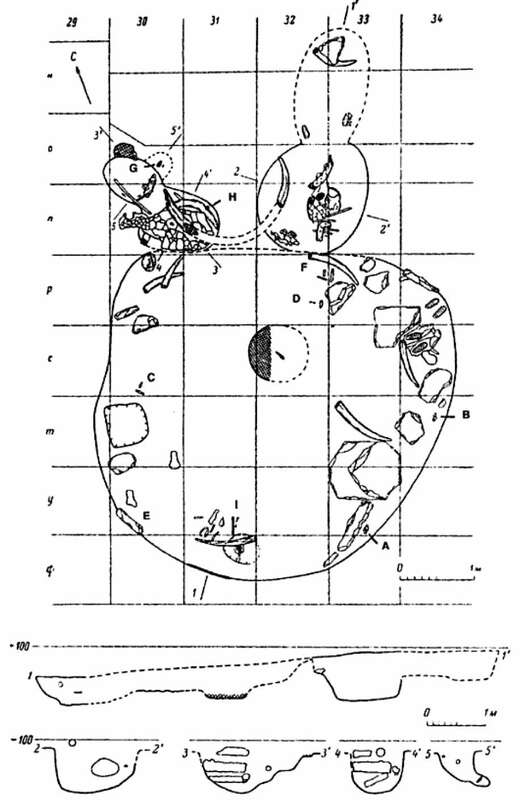 Black dots represent positions of Venus figures. 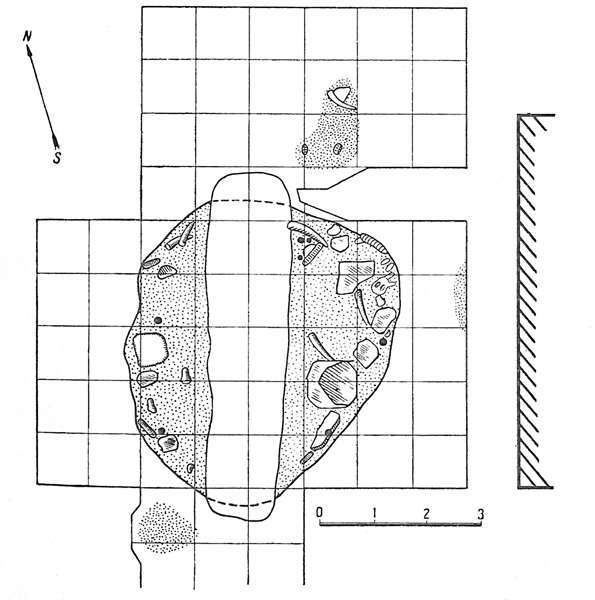 This diagram shows clearly the trench cut by the peasants who found the site while digging a silo trench, a technique for storing fermented feed known as silage. Gagarino blades with retouch. 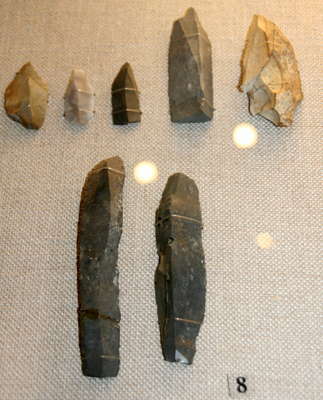 High skill and good stone is required for blades of this length and width. Gagarino tools on blades. 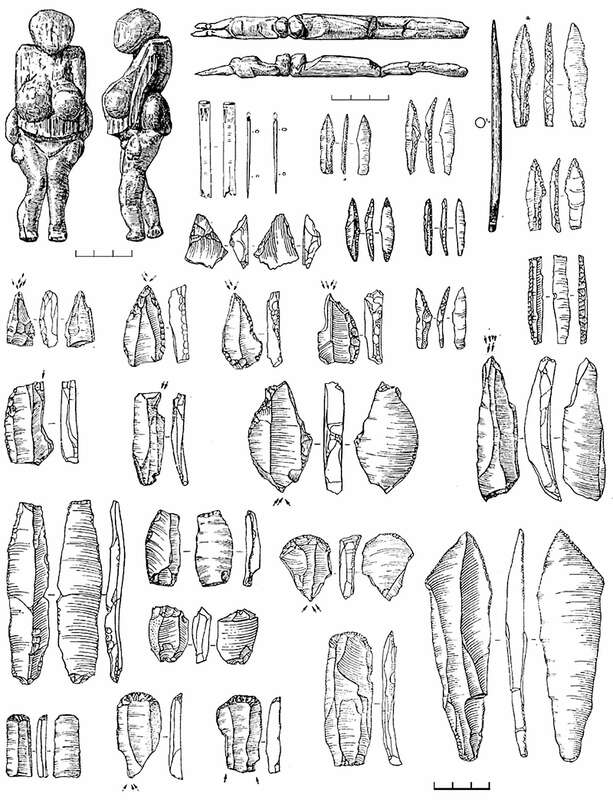 Note especially the shouldered points in the bottom row, knapped so that they can be hafted to form a knife, as at Kostenki, which has a very similar toolkit. 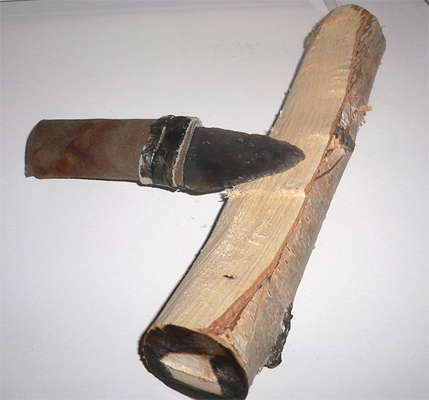 This shows the classic shouldered point, or point with tang, with a handle attached, as used at Kostenki. The tools are razor sharp, and very effective. Abramova Z., 1962: L'Art paléolithique sur le territoire de l'URSS. , Moscou-Léningrad: Académie des Sciences (en russe). 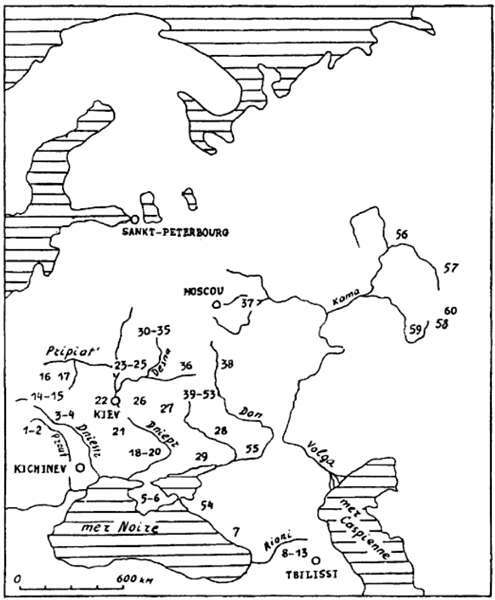 Tarassov L., 1965: La Station paléolithique de Gagarino, Moscou-Leningrad: Materialii Issledovania, t. 131 (en russe). 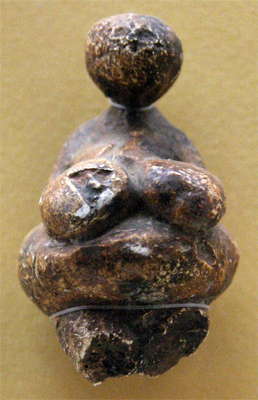 Tarassov L., 1971: La double statuette paléolithique de GagarinoQuärtar , 157-63. Tarassov L., 1979: Le site de Gagarino et sa place dans le Paléolithique de l'Europe, Leningrad: Académie des Sciences (en russe). Zamjatnin S., 1934: La station aurignacienne de Gagarino et les données nouvelles qu’elles fournit sur les rites magiques des chasseurs quaternaires., Les Éditions d’État, section social et économique, Moscou-Leningrad.